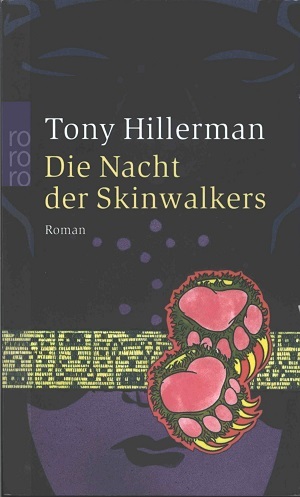 This is the 2003 German edition of Skinwalkers, Tony Hillerman's seventh Navajo Mystery novel. This edition was published by Rowholt Taschenbuch Verlag GmbH in Hamburg, Germany. The text was translated into German by Klaus Fröba, and the title directly translates to "The Night of the Skinwalkers." The cover was designed by Cathrin Günther and illustrated by Jürgen Mick. Format: Paperback, 18.9 x 11.4 cm.